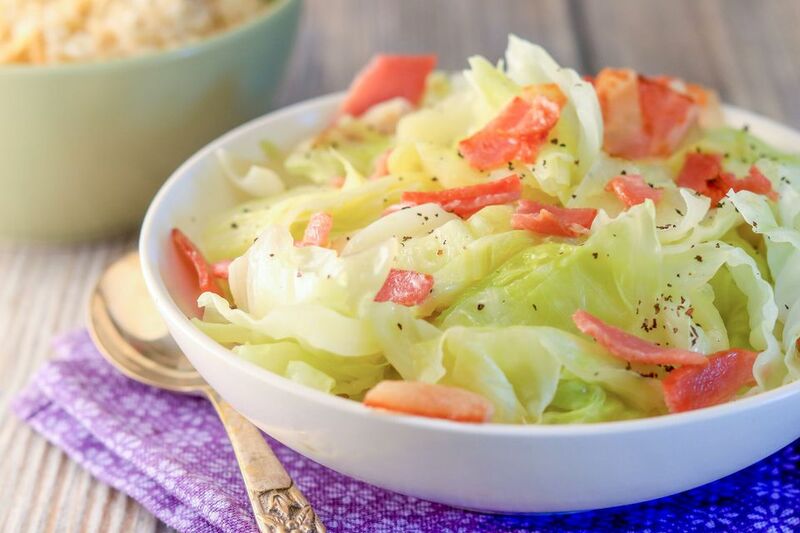 This super-simple boiled cabbage with bacon is an excellent choice for a Sunday dinner side dish, New Year's Day, or an everyday family meal. Or serve it along with your St. Patrick's Day meal. It needs no special prep; just dice and cook the bacon and onions, chop the cabbage, and then simmer the dish for about 20 minutes in chicken broth or water. That's all there is to it! The cabbage and bacon is a simple combination of ingredients but packs loads of flavor. Dice the bacon strips into 1-inch pieces. Peel the onion and chop it coarsely; set aside. In a large Dutch oven or deep sauté pan, cook the diced bacon until it is fully cooked but not crisp. With a slotted spoon, remove the bacon pieces to paper towels to drain; set aside. Leave about 2 tablespoons of the bacon drippings in the pot. Add the chopped onion to the bacon drippings and cook over medium heat until tender and lightly browned, stirring frequently. This step will take about 4 to 5 minutes. Cover the pot tightly and reduce the heat to low. Simmer for 15 minutes. Add more broth or water, as needed, and cook for about 5 to 10 minutes longer, or until the cabbage is tender. Add the bacon pieces and stir. Heat through and serve. To chop a head of cabbage, set it on its core on a cutting board; slice it into quarters. Remove the core and then slice it into 1/2-inch strips. Chop the strips, if desired. A medium head of cabbage weighs roughly 2 pounds and will give you approximately 8 to 10 cups coarsely chopped or shredded. Serve this great-tasting side dish with ham, a pork roast, chicken, or roast beef. For a vegetarian version, replace the bacon with vegetarian bacon or omit the bacon and saute the onion in vegetable oil. Use vegetable broth or water instead of chicken broth. For a lighter version, use less bacon or replace it with turkey bacon. For extra color and nutrients add a cup or two of fresh chopped kale to the cabbage. Caraway seeds complement cabbage dishes nicely; add a tablespoon or two of the seeds if you like. Instead of using bacon, saute the onion in 2 tablespoons of butter and then add diced leftover ham, smoked sausage, or corned beef to the cabbage about 10 minutes before the dish is ready.